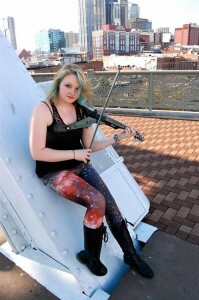 Elizabeth “Zee” Irelynn Crain is a freelance string player, and vocalist, as well as a singer-songwriter and multi-instrumentalist. As A Tennessee native, born and raised in Music City, she has been constantly surrounded by the music scene and the influence of the many great artists of Nashville. Zee began taking violin lessons in the Classical Suzuki Method at age four, learning primarily by ear, and has since grown to have a deep love and passion for music. At age thirteen, Zee also began taking viola lessons and joined the viola section in her local orchestra. In November of 2013, Zee was asked to join Mark Wood, and nine other students, on stage at the MuzArt World Foundation event called “We Are Hope” in Salt Lake City, UT. In February of 2012, Zee became the worship leader for Shelby Avenue Baptist Church in Nashville, Tn, where she played guitar, violin, and sang. In June of 2008, Zee was one of two violists who played as part of the featured musicians of the Hannah Montana Orchestra for “Hannah Montana: the Movie”. Currently, Zee plays violin, viola, and sings with her alternative-style quartet called Harbingers of Awesomeness, which was formed in the summer of 2013, with fellow instrumentalists and electric string-players Nick Schaefer, Michael Lucarelli, and Adam Rafferty. Zee attends Trevecca Nazarene University on scholarship for viola and is working towards her degree in Commercial Music Performance with an applied study in violin, emphasis in Recording Tech. On campus, she is part of the Trevecca Symphony Orchestra and Jazz Band as well as Lab Band II, which is an electric jazz/blues/rock group, in which she plays her Viper and sings. Zee is in the process of writing and recording her first album, which she hopes to have released by next fall. Along with violin, viola, and vocals, some of Zee’s other instruments include guitar, piano, and flute.